Afsan Chowdhury: Do we really care about Felani? 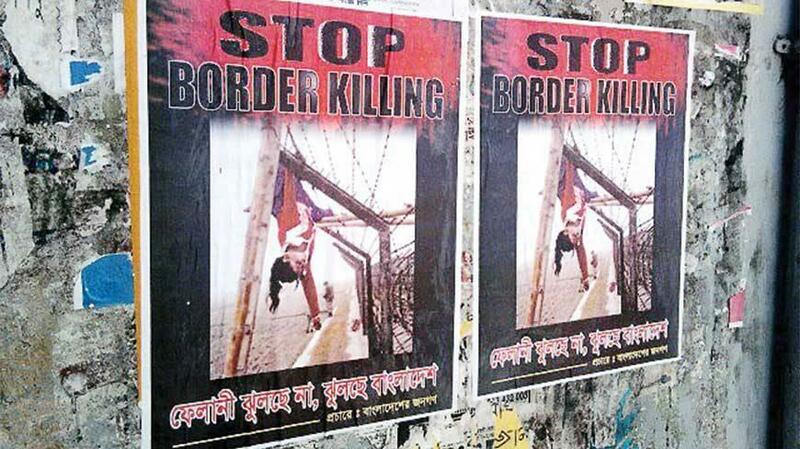 Posters protesting border killings showing Felani’s dead body. Source: Dhaka Tribune. Do we really care about Felani? Do you have to be shot by the Indian security forces and lie hanging on the border fence before anyone notices you? There are millions of such desperately poor girls who live out a terrible life and die but nobody pays any attention. But we notice Felani’s because it’s violent, involves our so-called sovereignty and also India, whom we dislike for many reasons. We don’t care about Felani, we just care about our own rage at India shooting our people. We don’t care about Felani, we care about our borders. There is probably no way we can turn our attention from the sensational to the continuing. This is human nature but in Felani we have found an excuse to be the raging soul that demands a pound of Indian flesh not justice. The visible and the obvious will always move us but it makes a contrast with our capacity to forget about what doesn’t hang from barbed wire fences on the border. In the end, we measure our identity in relation to our neighbour’s fault and not our own. If Felani has done anything it’s to strengthen our ability to ignore what we do and focus on the obvious scapegoats. Felani yes, but Felanis too. Borrowing this potent observation from Kundera we can say that in the political sphere we are moved only by those events that are symbolic in nature, such as Felani’s death. In her death we see all the “issues” that Afsan Chowdhury raises in his note above. However, we tend to forget all the other Felanis who live out their miserable lives everyday under our very eyes and die destitute without raising an iota of sympathy or indignation from us. Running further with Kundera’s idea, the deaths of these other Felanis are “symbolically mute” as they don’t fit into any neat symbolic category. Kundera closes the section on symbols proposing a criterion for maturity: the ability to resist symbols. We will attain maturity the day that we too can see all the Felanis out there, and not just the one who died hanging from a barbed-wire fence. Next Is it only survival? Is it politics without science? This apologia for Indian aggression is nonsensical. It virtually says that we should ignore Felani by not paying attention to her tragic death but lots of other Felanis. We need to focus on all problems including mistreatment of women, poverty AND border terrorism by India who is murdering unarmed Bangladeshi civilians who have attacked no one. This is not an apology for Indian aggression. This is a statement pointing out our double standards.